Today I am delighted announce both the winner of the March monthly newsletter giveaway and the prize up for grabs in the April giveaway! So firstly many congratulations to Steven the winner of our March giveaway the thought provoking dystopian novel Water & Glass by Abi Curtis with a signed bookplate. 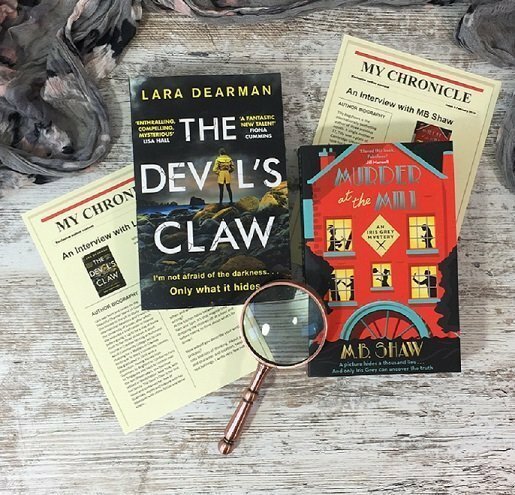 April’s prize draw is for a duo of great crime mysteries – Murder at the Mill by MB Shaw and The Devil’s Claw by Lara Dearman. Both these books come with a book plate signed by the author AND exclusive interviews! To be in with a chance of winning this great prize simply sign up to our newsletter by 20 April 2018.